Over the past few days, I've been sharing about a change God brought about in my heart during our second year of living here in Costa Rica. Finally, opening my mind and heart to truly listen to what God had to say to me about the doubts I was having about the effectiveness of our ministry, how hard my adjustment was, and how strategic and important our work really was lead me to a place of peace that I so desperately needed. Today, I'm sharing the final two questions that I took to the Lord at that time. My frantic question: Isn't this different from what you always wanted to do with your life? ﻿﻿﻿﻿Ouch. This is hard! When I was 13, I started praying that God would give me the opportunity to go to the former Soviet Union. A few years later, things started to a fall into place in a way that God had clearly prepared my heart for. Not knowing of my prayers, friends invited me to join their ministry in Ukraine when I was 17. I came home sure my life's calling was to missions somewhere in the Slavic world. I took more trips to Ukraine and to Russia, focused on studying Russian and Ukrainian linguistics in college, and, my heart and plans narrowed in on a certain region of Ukraine. So many events and friendships throughout my university years increasingly pointed me towards my heart's desire to someday serve full-time in Ukraine, including the provision of a fellowship to study during grad school at the very university I had dreamed of someday teaching English at, in Lviv, Ukraine. And, then, I fell in love with a man with a huge heart for the poor of Latin America, and that story is a very long one with its own set of frantic questions and God's answers. We got married ten days after I returned from studying in Ukraine! We prayed for several years about where God was leading us, and, eventually the answer was clear: Latin America. I genuinely was excited and eager to go, but the shock of how very different from Ukraine it all was once we arrived was really confusing for me. What started as little fears of "are we sure that we got this right? Did we miss something?" grew to the accusation of "this isn't what you wanted to do at all!" His answer: Many are the plans in a man's heart, but it is the Lord's will that prevails. That was it. That verse from Proverbs 19 was all I heard. I believe that God used my love for Ukraine and Russia to give me a heart for missions. I still miss it. I wish I remembered Ukrainian and Russian better than I do. I still hope that I will go back someday. The dream for our family to live in Ukraine someday is still there. But, I know that God's will is where I want to be more than anything, and He has us here now. 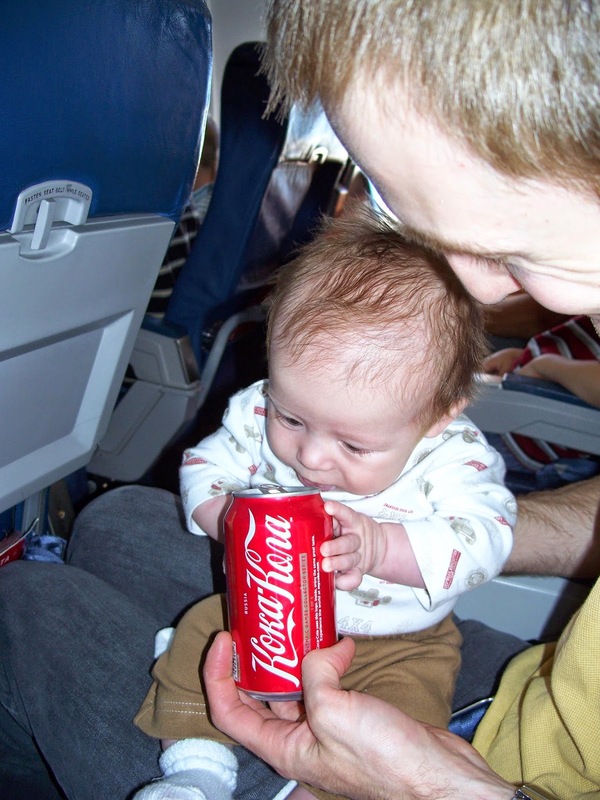 When we boarded our plane to move to Costa Rica, the flight attendant gave us a can of Coke that fascinated our 3-month old. The label in Cyrillic letters immediately jumped out at me, and I remember laughing at the irony. But, later, as I looked back at the photo during these struggles, I felt like God was whispering to me, "I know, Sarah; I know your heart. I know that plane, this journey, didn't take you where you thought it would. I love you, and I know the plans I have for you, and they are good." It is His will that prevails, and I am so thankful for that! Because of His leading and His gentle work to shift my heart, I am in a very, very different place than I was when I first took these questions to the Lord. I now absolutely love Costa Rica and its people, and I am blessed to be doing life where I never expected to be! My last frantic question? It's one I'm sure we can all relate to: Aren't you lonely there? His short, simple answer was the sweetest of all: I am with you always. That is just what I need to remember. Following Him does require leaving much behind, but knowing Him surpasses it all. The promise of His presence is what helps me face these questions as they creep up again (and they do! ), or as new ones arise. I'm praying that we can press in to God, taking our questions to Him, releasing our doubts and fears to Him, and that we can press on in the beautifully different call each of us have received from Him. Thanks for hearing my story, ladies! Oh me too! I had narrowed plans and put my heart - seemingly God-led - into Cambodia, expecting to stay there "forever." And my husband was called into missions for Bible translation in PNG. In the 10 years of service, we haven't lived anywhere longer than 1-2 years, never in PNG and only a little in Cambodia, and never got to touch Bible translation! Plenty of questionning, to be sure. The verse we got was "The Son of Man did not come to be served, but to serve, and give his life as a ransom for many." So we serve where and when and what God give us to and not what our hearts want. I understand. Thank you for sharing, this was encouraging. Love the photo of your hubby and baby on the plane. When I look at photos of us the day we arrived on the mission field, I feel this strange pain in my heart that I have only experienced and become familiar with at 35 years of age in the mission field. We had no idea all that was ahead…and how we would have to really forge on to be able to step into what the Lord had for us to do here. Like you, I am in Latin America… Puerto Rico to be exact…and the naysayers abounded, particularly since many believe Puerto Rico is practically the 51st state (it is NOT). I relate to everything in all of these posts except for the language adjustment. But the loneliness, conflict with other missionaries, feeling useless in this place, feeling like I could serve more effectively in English….wow. Thank you for sharing. You have no idea how encouraging your posts are for so many. Bless you, sister. So glad this was an encouragement, Annette! Que Dios la bendiga! Thank you for this. It was exactly the encouragement i needed. It's so easy to lose focus and so hard not to give up, but the reward of living in closeness with God should always be our drive. Not sure if this posted, please delete if it shows up twice! This has been a great series to read. We are preparing to go to Peru in the next year and I have asked quite a few of these questions (especially the serving in native language part and what possible role we will have!) as we step out in faith. The interesting thing to me is that the frantic questions closely resemble everything I struggled with as a new mom! I felt angry, confused, unuseful, lonely. And I am in my own hometown, with family and friends and all the abundance of America. 8 years into parenting and 4 kids later, God has taught me so much and my heart has been quieting. I am learning His joy, how to laugh at this crazy life, and He has started to grow us both in ministry in the last 2 years. And now it's time to go. It will be interesting to see how I face the cultural change. At least if I go through it all again, it will be slightly familiar ;) the mommy mission field has definitely been my frantic questioning time so far. Thank you for the warning!